Any gadget that has a wire sticking out of it is becoming obsolete. Quickly. The wireless revolution is transforming the way we connect, and it is changing the power structures that govern the Internet. The technology offers up the Internet without permissions, licenses and sometimes without fees. It’s known as WiFi: the forerunner in the open spectrum revolution that will bring the Internet to a new level. After many years in the lab and the upper circles of the worlds best technical universities, it has burst into the mainstream, and promises to be one of the fastest-growing communication technologies in history. Put simply, WiFi is the popular name for a set of wireless standards with names that nobody can remember – 802.11b, for instance. These standards govern how wireless networking is conducted, what frequency ranges should be used. Today’s common WiFi standard combines existing technologies – the Internet’s routing protocols, Ethernet’s data packets, and the multi-channel frequency bands of spread spectrum radio transmission. This allows for connection speeds of up to 11Mbps (Megabits per second) in the 2,4 Ghz band, within a range of about 300 feet. In layman’s terms, this means that you can go surfing up to three hundred yards from the nearest wireless node. The air around us is swarming with information – signals being sent through frequencies across the wireless spectrum. We are continually surrounded by machines communicating with each other – in ways that the first pioneers of wireless, like Marconi, never would have thought possible. The frequencies of what is known as the ultrawideband spectrum covers all kinds of radio transmissions, from AM and FM radio and devices such as garage door openers at the bottom end, through cell phones and GPS, to satellite television at the top. So, why you may not see or feel anything, you are surrounded by wireless communication at all times. And this is an absolute necessity – try to imagine how many wires would be needed to replace all those signals. It would be like walking through spaghetti. We do, however, still use wires to connect our computers to the Internet. The problem so far has been that the connecting technology as been designed around the existing telephone networks. Although you can connect through your cell phone, the GSM network is not designed to handle high-speed transfer of large amounts of data. 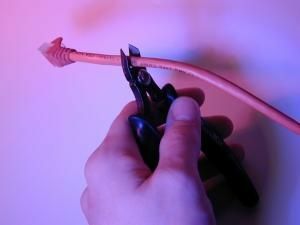 So, even as the telephone companies have scrambled to extract as much capacity as possible from their cables – and retain their customers and revenue – there have been efforts to find other effective ways to connect. The technology that is connecting computers without the familiar cables has been arriving over the past three years. It is, in many ways, a technology of freedom, of access, and of openness. This liberation of the airwaves has the possibility to be as much of a revolution as was the emergence of the Internet itself, because it takes some of the distribution power out of the hands of the big telcos and places it with private interests. Phone companies, who make their revenue from owning land lines and cell phone networks, have been banking on developing wireless connectivity through extending their proprietary technologies. US companies are trying to catch up with their European counterparts, and the Europeans have invested heavily in the new 3G networks – betting that they could prove to be a suitable platform for wireless multimedia distribution. But 3G development has hit one snag after another, and the $110 billion the telephone industry have invested in the new network are looking like a mistake. And at the same time, a new connection technology is growing from the grassroots, threatening to create havoc in the industry’s revenue schemes. The promise of WiFi is exciting for the user, and somewhat alarming for the ISPs. Because open spectrum technology is resistant to government regulation and has grown out of a grassroots movement in an organic fashion, WiFi may prove a difficult technology for the established network providers. But it is very foolish to assume that any technology with this much potential revenue can be kept away from the industry players that are currently making money from consumer Internet connections. T-Mobile, Swisscom, TeliaSonera and Telenor, to name a few, are busy deploying hotspots all over Europe. But they are forced to think differently this time. And that is a major achievement for any grassroots movement.